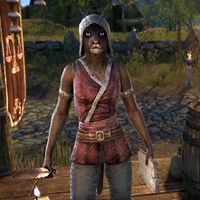 Fada-daro is a Khajiit merchant who can be found in Longhaven. When approached, she shares, "Fada thought merchant life wouldn't be so bad. Certainly safer than picking pockets. But, you know, this one sometimes misses the thrill of the hunt."